This card’s name becomes “Cyber Dragon” while on the field or in the GY. During each Battle Phase, if this card has not declared an attack (Quick Effect): You can target 1 Machine monster you control with 2100 or more ATK; for the rest of this turn, that monster gains 2100 ATK/DEF, also neither player takes battle damage from battles involving this monster. You can only use this effect of “Cyber Dragon Sieger” once per turn. Cyber Dragon Sieger is a beautiful way to end the week. It’s a Link 2 Light Machine-type Link Monster with 2100 Attack and with Left and Bottom Arrows. It requires a Cyber Dragon and any other Machine monster to Link Summon Sieger properly. While it’s on the field or in the grave, Sieger becomes regular Cyber Dragon in name and stats which isn’t too bad. If it hasn’t attacked you can target a Machine you control with 2100 or more attack and give it 2100 Atk and Def for the rest of the turn, but only during the Battle Phase of either player’s turn as a Quick Effect. It can technically target itself, but you won’t be doing Battle Damage with this monster for the rest of the turn either. 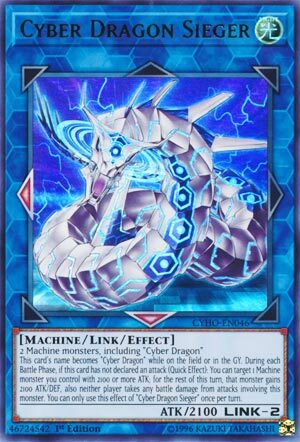 Cyber Dragon Sieger is great support in general for Cyber Dragons and an excellent Link Monster for an offensive deck. I’d run 2 in the Extra Deck at least. I felt like the main support card in Cybernetic Horizon for Cyber Dragons was a good way to end this week off, so here I’m ending this week with the Cyber Dragon Link Monster, Cyber Dragon Sieger. Sieger is a Link-2 LIGHT Machine with 2100 ATK with arrows pointing Down and Left and requires two Machine monsters as materials including 1 Cyber Dragon at least. ATK is good on a Link-2. LIGHT and Machine are great for type and attribute, though all Cyber Dragons really have this combination. Down and Left arrows leave this to have great synergy in a Main or Extra Monster Zone, which is good if you revive this with Cyber Dragon Nova, cause this card is treated as Cyber Dragon while on the field or in the GY, which is great to have on this for synergy with the archetype to revive with Nova or Revsystem. During each Battle Phase, there are only a few cards that give multiple Battle Phases in a turn so that is probably why it is worded like that, if this card has not declared an attack yet (Quick Effect): you can target 1 Machine with 2100 or more ATK and for the rest of this turn it gains 2100 ATK and DEF but for the rest of this turn neither player takes damage from this card’s battles. This can be dangerous on something like Chimeratech Rampage Dragon, Cyber Twin Dragon, or maybe even Cyber End Dragon. Having high ATK on a monster that can do multiple attacks or deal piercing is great, this really helps Cyber Dragons have more power to them to do an OTK or deal massive damage. This is a hard once per turn effect of Sieger, so I guess the part where it mentions each Battle Phase doesn’t matter. Sieger is great for dealing OTKs in the Cyber Dragon deck as well as making sure your Extra Deck plays are extended. Sieger is another must in the Cyber Dragon Extra Deck, probably a 2 of. Art: 5/5 I really like the evolution of Cyber Dragon here. This, you likely saw coming also. Cyber Dragon Sieger is Link 2 (requiring two Machine Monsters, one being Cyber Dragon) who then becomes Cyber Dragon, arrows here are to the immediate left and directly below, not bad choices…Machine, Light, 2100 attack, so this is again, very familiar to see. Honestly, I don’t see this guy as SUPER awesome. He might break a game open, but I wouldn’t fault a player who uses this theme for not playing Sieger. Not that I would either fault one for using it.